With over 18 million produced each year, JT sells more sprockets than all other aftermarket brands combined. Their popularity is a testament to the quality and unbeatable value that's standard with each JT sprocket. 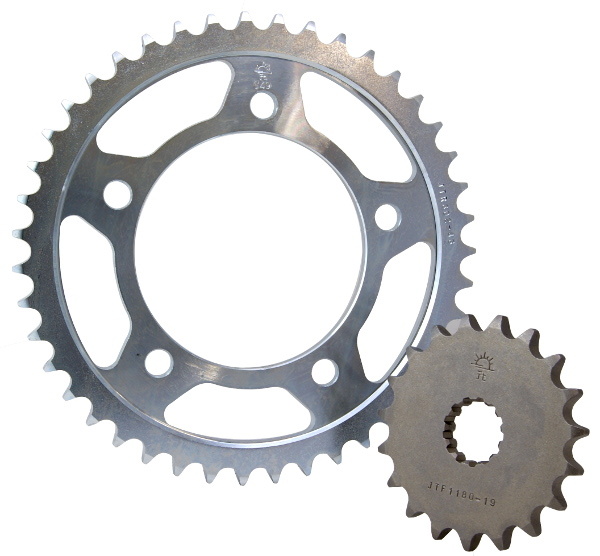 fully heat-treated (hardened) high carbon steel SAE 1049/SMC420 Japan (front sprockets). CNC machined for great performance and lifespan. JT sprockets go through 25 production processes and 10 individual checks before they leave the factory. It's through these strict methods that JT can guarantee its sprockets will meet or exceed standards for the motorcycle industry. The full JT range, which includes steel and aluminium racing sprockets, is available at Wemoto. Wemoto also sells JT sprockets as part of a kit, to include JT front and rear sprockets, with a choice of Swift or DID chain.